The Rockies have announced that they’ve reinstated righty Chad Bettis from the 60-day disabled list and optioned him to Triple-A. They’ve also placed lefty Kyle Freeland on the 10-day DL with a groin strain. In addition, they’ve recalled righties Shane Carle and Carlos Estevez and optioned Scott Oberg to Triple-A Albuquerque. Bettis’ return to official minor-league duty, as well as his impending return to the Majors, is terrific news not only for the Rockies and their fans but for baseball as a whole. The righty had surgery for testicular cancer in the offseason, then began chemotherapy a few months later once it turned out the cancer had spread. He finished chemo in mid-May and returned to the Rockies in early June. He’s since had five rehab appearances, and he’s expected to return to the big-league rotation next week. Bettis posted a 4.79 ERA, 6.7 K/9 and 2.9 BB/9 over 186 innings in the big leagues last year. Freeland left yesterday’s start against Philadelphia after just nine pitches. The 2014 eighth overall pick been one of the keys to the Rockies’ surprising success this season, posting a 3.70 ERA, 5.7 K/9 and 3.3 BB/9 in 121 2/3 innings in what’s been a strong rookie year. The Braves, on the hunt for starting pitching, sent a top scout to Detroit this weekend to watch Tigers right-handers Justin Verlander and Michael Fulmer, reports Mark Bowman of MLB.com (on Twitter). Neither Verlander nor Fulmer seems like a realistic trade candidate, however. The Tigers reportedly want a noteworthy haul for Verlander, even though he’s 34, in the throes of a down season and still owed nearly $70MM through 2019. Verlander also has a full no-trade clause, so he could veto a deal even if the Braves do present an offer to the Tigers’ liking. Unlike Verlander, the 24-year-old Fulmer is both cheap and in his prime. Detroit would justifiably demand a ransom in return, then, but there’s no indication it’s interested in parting with him. Realistically, no one would have expected the Brewers to hold a 5.5-game advantage in the NL Central this late in the season, which could lead to an agonizing deadline for the team’s decision-makers, as Tom Haudricourt of the Milwaukee Journal Sentinel writes. The Brewers, who were in on now-Cub Jose Quintana before the White Sox traded him Thursday and have interest in the Athletics’ Sonny Gray, must weigh whether to make a bold strike that eats into their farm system or take a more conservative approach. General manager David Stearns doesn’t seem eager to part with a prospect haul, telling Haudricourt: “We’ve worked very hard to build our system and organization as a whole where the level of young talent we have is a good place to be. I don’t see us, whether it’s this year or any year going forward, moving from that strategy.” Nevertheless, Haudricourt points to Gray’s team control, his connection to Milwaukee pitching coach Derek Johnson (who coached Gray at Vanderbilt) and the Brewers’ rotation questions as reasons why acquiring him would make sense. Speaking of the Brewers, their success has come without having left fielder Ryan Braun at full strength, and his health will continue to be an issue for the rest of the season. Manager Craig Counsell said Saturday (via the Associated Press) that the Brewers will evaluate Braun daily through the end of the year, given that a strained right calf has hampered him for a while and forced him to the disabled list twice. While the 33-year-old has once again been a quality contributor to Milwaukee’s offense, having hit .260/.343/.553 across 169 plate appearances, Counsell believes there’s enough talent on hand to weather Braun’s issues. “We certainly want a healthy Ryan Braun, but we’ve had success with this team because of depth and we’ll continue to rely on that if we have to,” Counsell said. Phillies outfielder/infielder and trade candidate Howie Kendrick has been out this month with an injured left hamstring, and a return doesn’t seem imminent. Kendrick will join the Phillies in Miami on Monday, but only so the team can evaluate him to see if he’s healthy enough to embark on a rehab assignment, tweets Todd Zolecki of MLB.com. Currently in possession of a wild-card spot, the Rockies will temporarily remove one of the best starters from their rotation in order to preserve his arm, according to Patrick Saunders of the Denver Post. 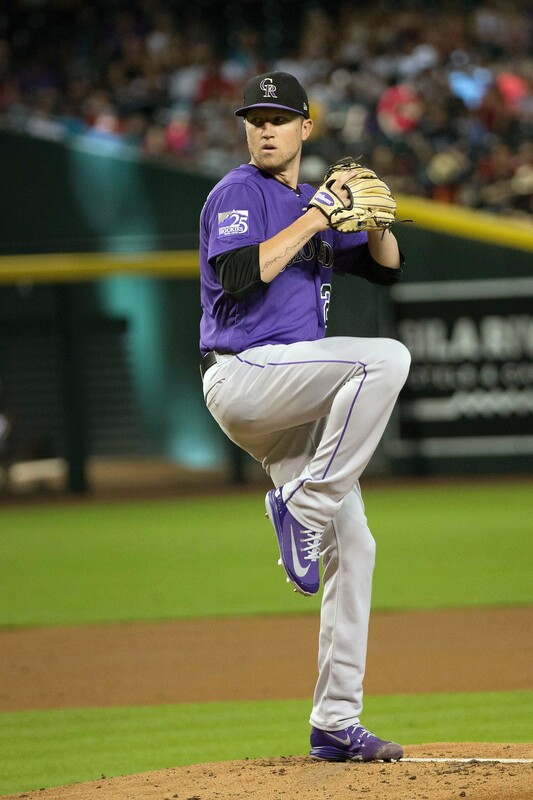 Rookie left-hander Kyle Freeland, who’s top two among Rockies starters in innings (110 1/3), ERA (3.67) and ground-ball rate (55 percent), is likely to head to the bullpen and could then log some time in the team’s Triple-A rotation before resuming his starting role in Colorado. Another rookie, righty Antonio Senzatela, looks primed to take Freeland’s place in the meantime. Freeland threw three shutout, no-hit frames in relief Saturday, when the Rockies lost starter Tyler Chatwood to an undisclosed injury in the first inning, per Saunders. Dodgers catcher A.J. Ellis is the top game caller in the league, writes Harry Pavlidis for ESPN. In recent years, new data and techniques have allowed analysts to measure catcher framing skills. Pavlidis evaluated the various factors controlled by a catcher’s game calling and converted them into a runs saves statistic. Ellis draws negative reviews for the other aspects of his defensive game, but he’s credited with 38 game calling runs saved from 2012-2014. Rounding out the top five are Alex Avila, Yadier Molina, Derek Norris, and Ryan Hanigan. Shortstop Jimmy Rollins is taking a pragmatic approach to the possibility that he could be supplanted by top prospect Corey Seager, writes Ken Rosenthal of FOX Sports. Rollins is under contract for the remainder of the 2015 season, and he’s hitting a tepid .210/.278/.352 with five home runs and five stolen bases. The club moved him down to eighth in the lineup this evening, signaling impatience with his slow start to the season. Seager recently had a 13-for-18 stretch at Triple-A, but Dodgers officials haven’t indicated any plans to promote him. Rollins understands that his role is to help the Dodgers bridge the gap until Seager is ready for major league action. Rockies 2014 first round draft pick Kyle Freeland has yet to pitch this season, writes Nick Groke of the Denver Post. The left-handed pitcher was selected eighth overall last June. He is currently recovering from shoulder fatigue and surgery to remove bone chips. He began a throwing program within the last week. Freeland had a positive debut for the Rockies, throwing 39 innings with a 1.15 ERA, 7.6 K/9, and 1.4 BB/9. Another Rockies prospect, outfielder David Dahl, required emergency surgery after colliding with a teammate, reports Thomas Harding or MLB.com. Dahl had surgery to repair his spleen but did not suffer a concussion or a broken rib as was originally feared. The 2012 first round pick is ranked as the second best Rockies prospect by MLB.com. Dahl is hitting .269/.296/.379 in 189 plate appearances at Double-A. 6:48pm: The bonus will land at $2.3MM, reports Jim Callis of MLB.com (Twitter link). That means that Colorado will save about $890K to put towards other choices. As Callis explains (Twitter links), Freeland ended up in a difficult bargaining position due to a high school medical report that contained speculation about possible elbow issues. In spite of that loss of leverage, Callis notes, Freeland still ended up with at least mid-first-round money. 6:19pm: The Rockies have reached agreement with first-rounder and eight overall choice Kyle Freeland, reports Thomas Harding of MLB.com (via Twitter). He reportedly will take hom a bonus of approximately $2.5MM, significantly below his slot allocation of $3.19MM. The lean southpaw has plus-plus command, in BA’s estimation, and has moved his heater into the low to mid-90s. His secondary offerings are led by a mid-80s slider and also include an average curve and decent change. Though Law notes that Freeland did not face top-end competition in college, he did put up a ridiculous 15:1 strikeout-to-walk ratio last year. While Law rejects the comparison, Freeland has’s body type has led to comparisons to Chris Sale. And as with Sale when he was a draft prospect, some have expressed concern that he’s ultimately ticketed for the bullpen. Colorado entered the draft with about $8.35MM in achievable pool money from the first ten rounds. The club was aggressive with taking high school prospects elsewhere in the early stages of the draft, nabbing Forrest Wall at 35th overall, Ryan Castellani at the 48th slot, and Kevin Padlo an Max George with its fifth and sixth-round choices. The Rockies will now have about $690K extra to play with in signing those players.